This flat style gas oven igniter has an amperage range between 3.2 to 3.6. This part comes with two ceramic wire nuts. Range, Wall Oven, Microwave Oven Combo. Checked the top burners and broiler operation, they worked. Checked amp. draw for the oven igniter. Low, even though it was glowing. Replace igniter and rechecked oven operation, ok. The oven burner now works. When turning on the oven, it would not ignite. Unplug the power.Took off the broiler door . Reached in , unscrewed the two screws holding the igniter (one screw was stripped so that gave me a little problem) put on the new igniter. Stripped the wires & put the caps on. Plugged back in the stove & worked great. Took off racks, oven covers, and heat shield. Cut one wire at a time ensuring I remembered what wire went where. Spliced the wire together and re-connected everything else. Works better then before, preheats in 8mins to 350 degrees. Removed oven grills and oven bottom floor plate secured by two thumb screw bolts at rear of plate which exposed v-shaped iron plate covering the igniter and the gas emitter pipe. Remove the iron plate secured by a single 5/16" nut. Disconnected igniter from mount with nut driver and followed connection instructions enclosed with igniter for attaching the two wire connectors. I removed the old one and cut the wires on it. Spliced the wire so the new one and attached It. Very simple. The repair is straight forward, make sure to turn off the gas and power to the stove. First, you will remove the shield(s) in the bottom of your oven, first with a flathead screwdriver with the two screws in the far back. Then there is a center nut and 3 screws on the next shield, my advice here is to get a 1/4" socket because they have a odd sized square hole in the middle and are not metric. After removing that shield it exposes the flat style oven igniter, it has two screws holding it in that are also 1/4". 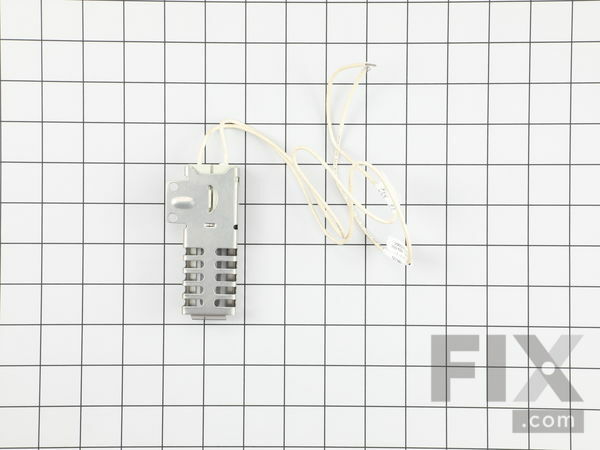 After removing the screws from the igniter, remove the broiler pan and tip the oven back against the wall behind it. Cut the appropriate wires and twist the wires from the new igniter onto them using the provided wire caps. Then just put the oven back on the floor and screw everything into place...This repair should really take less than 15 minutes even for a novice but I spent longer than I should have trying to make an adjustable wrench work when I should have just got the 1/4" socket. Unplug stove from wall , removed inside bottom of stove and the heating plate. Then removed the igniter. Had to save the plug and splice the connectors to new igniter and re-installed the new igniter. Plugged oven back in to wall. Oven works great! Very simple repair. Removed oven door, racks, & bottom pan. Removed the 2 bolts holding the bad ignitor & 2 wires. Installed new ignitor, very easy to do. Oven lit right up. 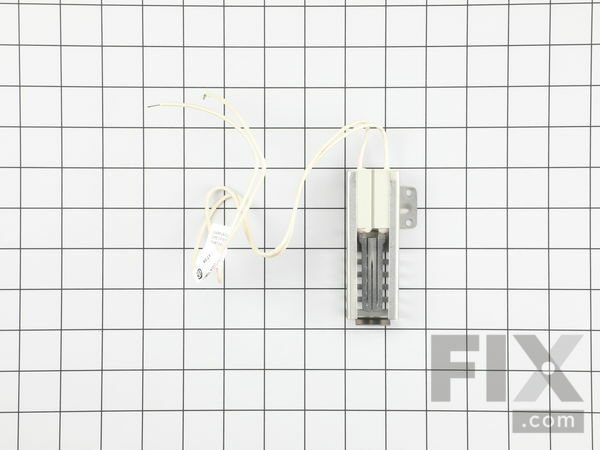 I narrowed the problem down to the three major components that would cause the problem and after doing research on the Frigidaire web site, I saw that the igniter had the highest percentage of failure, and would resolve the issue 97% of the time. I ordered a replacement and it was here in 2 days (outstanding service!!!!) I read the other posted replacement steps and decided that I could do it the same way with one small difference: I removed the oven "floor" plate and the broiler drawer which gave me unhindered access the the part I needed to replace. I unplugged the oven and after cutting the leads of the new Igniter to length, stripping the insulation back to expose the wires, I used the supplied ceramic barrel nuts to join the 2 wires, made sure there wouldn't be any issues with the routing, reassembled the oven floor plate and broiler drawer, plugged the appliance back in, and tested. Success, it now works great and I saved a lot of money over having to buy a new oven !! !